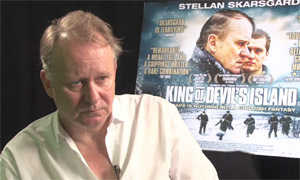 There are few actors in world cinema with the pedigree of Stellan Skarsgård, and the Swedish actor returns to Scandinavia in his latest picture King of Devil’s Island – and I had the fortune of sitting down and having a good old chat with him about it. The Norwegian production depicts the harrowing true story of a young offenders home for boys in Bastoy, in the early 20th century. Skarsgård plays Bestyreren, the governor of the institute; a good man, but one whom is heading a somewhat sadistic regime.